TORONTO, Sept. 5, 2012 /CNW/ - Fall head over paws for an adopted dog, cat, puppy or kitten during the PetSmart Charities of Canada's National Adoption Weekend. Sponsored by PetSmart®, from September 14-16 you can visit your neighbourhood PetSmart store to participate, gain a loving companion and give a forever home to a deserving pet. The event brings together more than 126 Canadian, local animal welfare organizations with a variety of adoptable pets in need of homes and a perfect match for you. Both purebreds and mixed breeds are available for adoption, as well as cats and dogs looking for their lifelong home. "Adoption is one of the key ways to save pets and end pet homelessness, not to mention enrich our own lives with a loving companion," said Susana Della Maddalena, executive director of PetSmart Charities of Canada, Inc. "Thanks to generous donations from our supporters, PetSmart Charities of Canada funds hundreds of adoption events and awareness programs each year that have helped find homes for more than 130,000 pets." Animal welfare organizations will be on-site in all PetSmart stores across Canada and will participate in National Adoption Weekend. These events are proudly sponsored by PetSmart, Purina® Pro Plan® and MAXX Scoop®. Every adoption benefits participating local animal welfare organizations and rescue agencies which receive $35 in adoption-reward grants from PetSmart Charities of Canada for every pet they adopt during the event. "Each year, more than 140,000 companion pets are admitted into animal welfare organizations in Canada," said John DeFranco, vice president of supply chain, merchandising and marketing, PetSmart Canada. "We are committed to working with PetSmart Charities of Canada to help save the lives of homeless pets. By offering training classes and a variety of products that help pet parents, we help these pets stay in happy, forever homes." 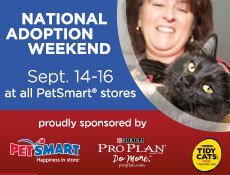 Visit the PetSmart Charities of Canada's adoption center inside any PetSmart store in the Canada from 9:00 a.m. to 9:00 p.m. on Friday, September 14 and Saturday, September 15; and 10 a.m. to 6 p.m. on Sunday, September 16. To find the PetSmart store nearest you and to learn about the adoption center's fees and guidelines, visit www.PetSmartCharities.org/adoption or call 1-877-473-8762. All of PetSmart Charities of Canada'a programs are made possible through donations. You can contribute to programs that save lives by making a donation online, by email at gifts@petsmartcharities.org or by calling 623-587-2826. Your donation may be tax deductible. Stay up-to-date on the many ways PetSmart Charities of Canada is saving the lives of homeless pets by visiting www.PetSmartCharities.org and by following on Facebook at www.facebook.com/savehomelesspets.